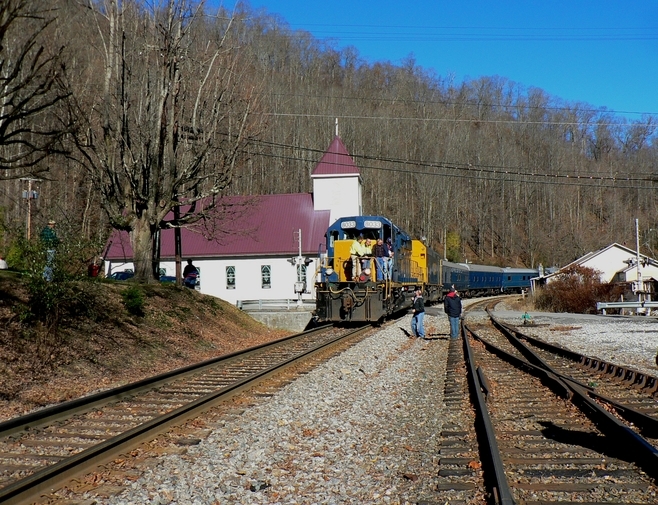 There is simply a magnetic appeal about the Clinchfield Railroad that beckons to the spirit. 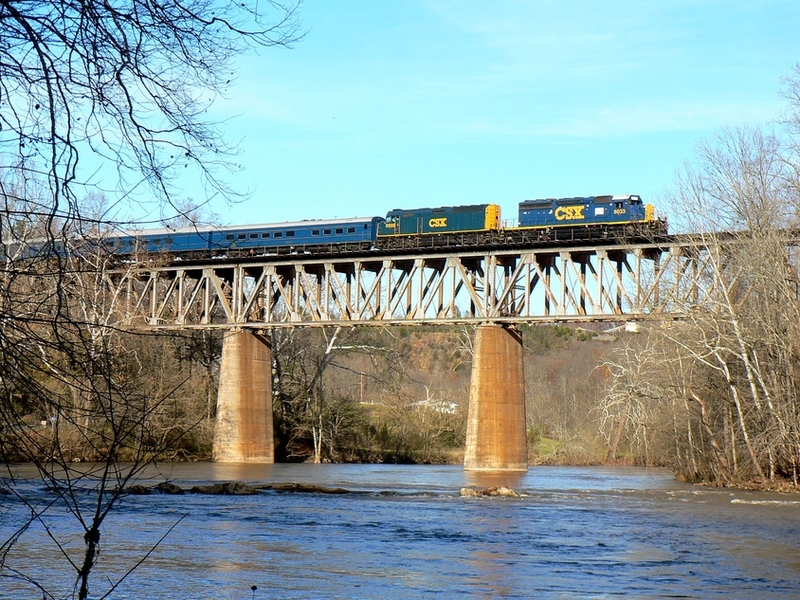 A small Class I railroad surrounded by giants, it served as a connecting north south bridge line connecting the coalfields of Appalachia to the Piedmont region of the Carolinas and beyond. 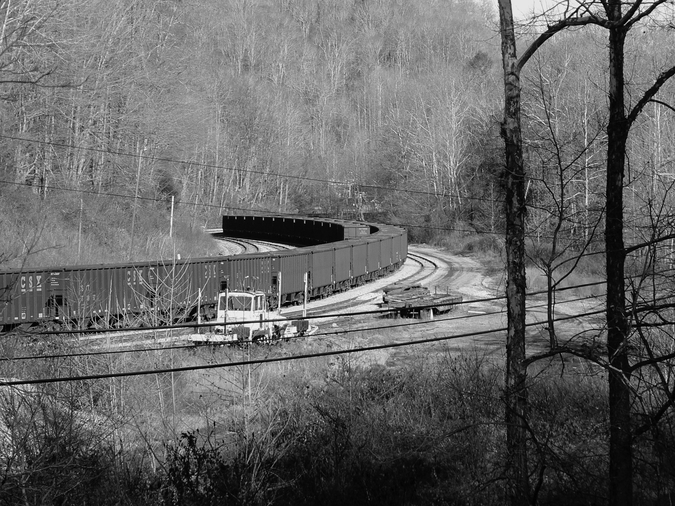 Yet in spite of its role as a connector, it firmly established an identity of its own---a coal hauler traversing a well-engineered route through the mountains and valleys of southern Appalachia extending to the textiles of the Carolina Piedmont .But its everlasting stamp is the communities of which it passed from its beginning at Elkhorn City, KY to its southern terminus at Spartanburg, SC. 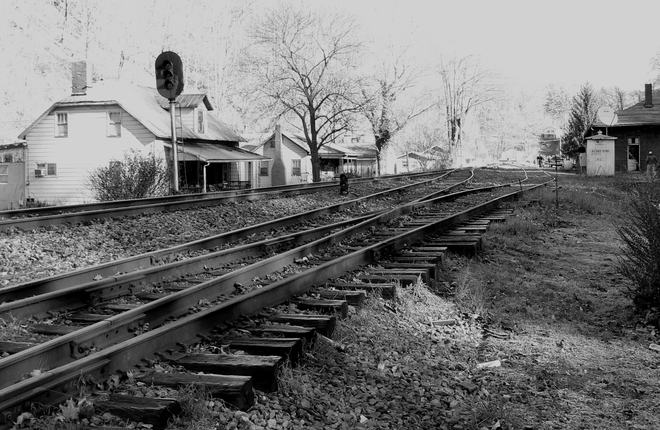 As the years passed, the railroad became a small component of increasingly larger rail systems. In the early 1980s, it first was absorbed into the Seaboard/Family Lines network--by the end of the decade, the melting pot increased substantially with the operational formation of CSX. In spite of the mergers, however, the railroad never lost its identity with those who worked its territory or watched its trains. It was and forever will be the Clinchfield. From a personal standpoint, I deeply regret having spent precious scant time along its rails. There were plans to do so during the passing years but were never fulfilled for an assortment of reasons. My first glimpse of the line was years ago during the 1970s near its beginning at Elkhorn City. During the late 1980s when CSX motive power was a potpourri of predecessor paint schemes, I saw its locomotives. But aside from these instances, my only exposure to the Clinchfield route was the Marion-Bostic area in North Carolina firmly entrenched in the CSX era. Reflecting on my experiences with the model railroad world, the Clinchfield served as in inspiration. A landmark series of building an N scale layout articles based on the railroad appeared in Model Railroader magazine during 1978 of which I thoroughly appreciated. 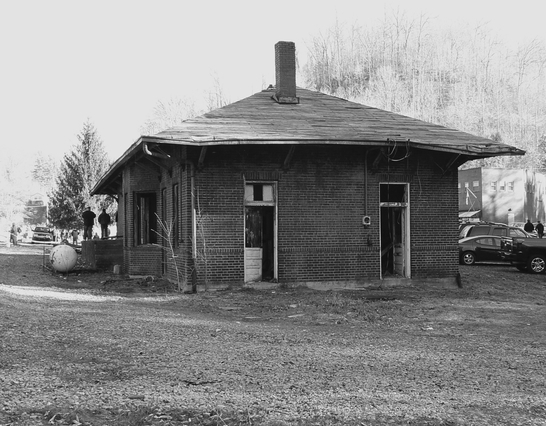 In 1943, the Clinchfield Railroad launched its inaugural Santa Claus Special as a charitable gesture to the communities along the Appalachia sector of its corridor. In an area beset with strife and poverty---even in prosperous times when the coal mining industry boomed---a large percentage of people still languished economically. This train, stopping at selected points along the route, became a dispensary distributing toys and other gifts to residents in dire need. Although the premise of the now named "Santa Train" was to assist materially, what it came to symbolize was the act of giving and hope. No matter the hardships endured, there was indeed the belief in Santa Claus and that he would return every year. 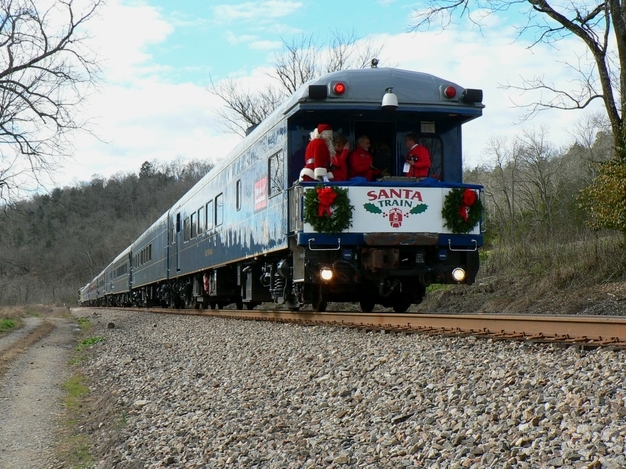 Fast forwarding to 2015, the Santa Train has established a long standing legacy. Commencing with its 73rd annual running, it is reflective of three quarters of a century founded in generosity and human compassion. It has also become an annual foray for the rail photographer and historian throughout the years as well. 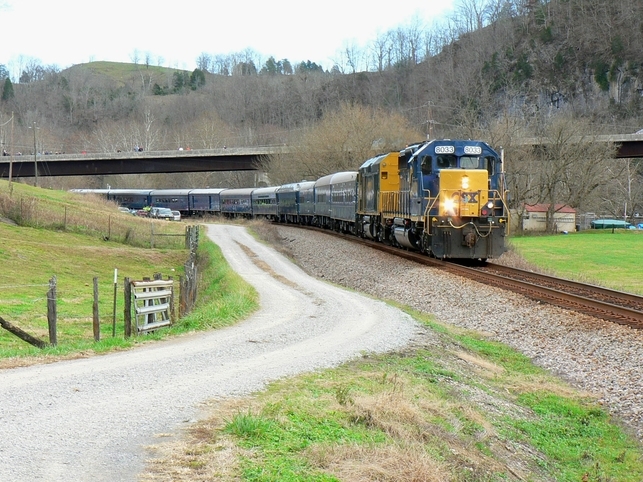 During the passing decades, it has featured unique motive power, both steam and diesel, pulling the Santa Train through breathtaking Appalachian vistas highlighted with tunnels and high bridges. In 2015, for possibly the first time in its history, the atmosphere preceding the running of the Santa Train was gloomy. Modern day events seemingly interrupted that safe and secure world of fantasy that previously seemed infallible to change. 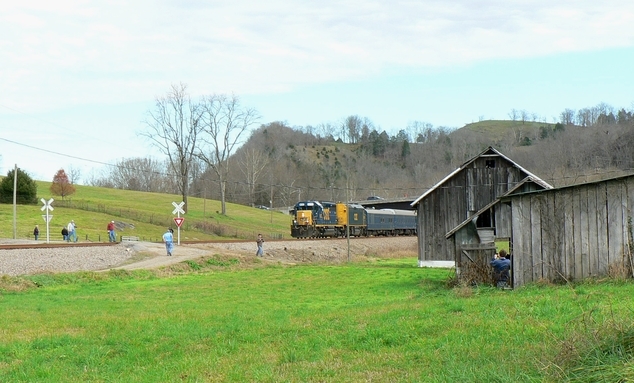 In October, CSX closed the Erwin, TN shops, abolished and rerouted trains, and announced that the Clinchfield route would cease operations as a mainline corridor with a section of route mothballed (left intact but not used) citing the decline of coal traffic as the reason. Hundreds of employees were out of work as a result. Rumors and speculation immediately permeated the railroad community that the train would not operate and later, this year would be the final running. It was against this backdrop that I and thousands of others made the trek to Clinchfield country to see the train for the first time or perhaps the twentieth. All of us hoped it would not be the last. My son Matt and our mutual good friend David Weaver accompanied me on the trip to see the train. 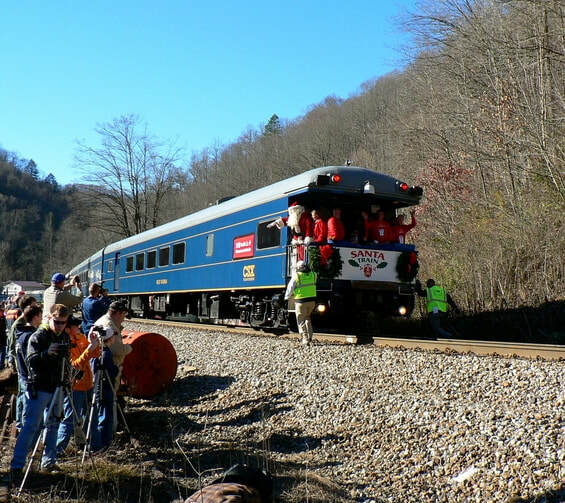 David is a veteran of Clinchfield expeditions yet he had never seen the Santa Train in all his years of visiting the territory. His knowledge was invaluable and in return, he fulfilled his personal desire to finally see this special train. We knew we could not see the train for the entire route or at every stop so we picked the ones that would fall into place. Leaving Kingsport, TN early that November 21st morning, our goal was to at least make it as far north as Dante, VA. 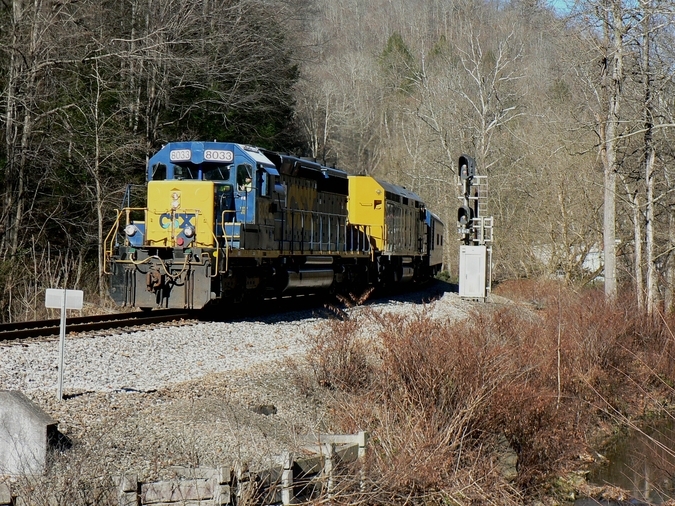 The CSX motive power for the 2015 train featured SD40-2 #8033 and one of the executive units, F40PH #9998. Both were sparkling clean in their YN3 paint and proved to be photogenic on a bright sunny day. In this age of heritage units and rejuvenated steam excursions, a special painted Clinchfield diesel or steam locomotive would have been the epic power. Since this was obviously not possible, the #8033 was an adequate choice---at least it was a classic EMD with Louisville and Nashville and later Family Lines (which included Clinchfield) lineage. Shortly after we arrived at Dante, VA, I met a CSX employee who had retired only a year before. After discovering he was local to the area, my next question to him was what is the correct pronunciation of Dante? I have heard it spoken as "Dan-tay" and "Don-tay" but he said the correct pronunciation is "Dant". Afterward, I saw and spoke with a few other fellow CSX employees, past and present, one of whom had come from as far away as the North Baltimore, OH intermodal terminal. As the crowd gathered at Dante awaiting the arrival of the Santa Train, I walked around the vicinity of track taking a few photos and engaged in small talk with a few of the folks. Most, like me, were here to see what possibly might be the final running of the train. There were CSX employees scattered about wearing either a company hat or a jacket with the embroidery of where they work or formerly did. Of course, photographers were scattered about filling memory card bytes with images of the town and scoping out prime locations. It was a beautiful Saturday morning---bright sunshine highlighted the branches of the leafless trees and a clear blue sky tempered with just a bit of mountain chill. The weather man was spot on ensuring that “nice” was checked beside his name on Santa’s list. Dante is the quintessential Clinchfield town. So reminiscent of innumerable coal towns that I have seen in West Virginia and Kentucky tucked away in narrow valleys with the community packed tightly against the railroad. 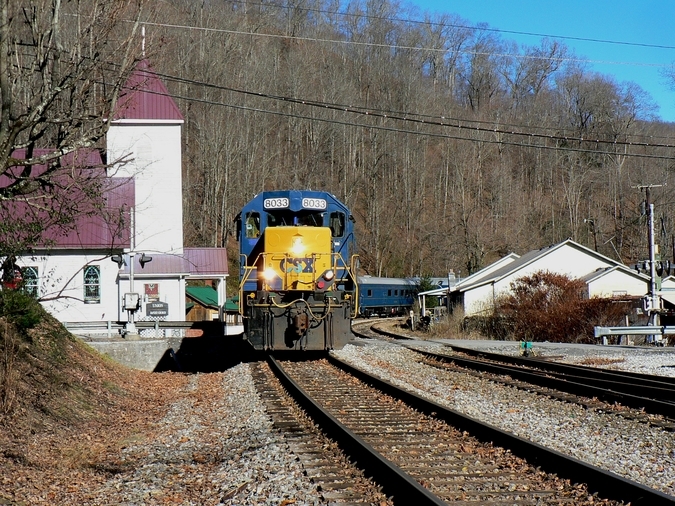 A nostalgic charm resonates---Union Baptist Church, the homes, the old depot, the Clinchfield signals. To be sure, its heyday has passed but there is a pride among the people of Appalachia founded in a heritage of hard work and an independent spirit regardless of economic disposition. Much of this is preserved for posterity here—if but only in ink and artifact--- at the town museum. 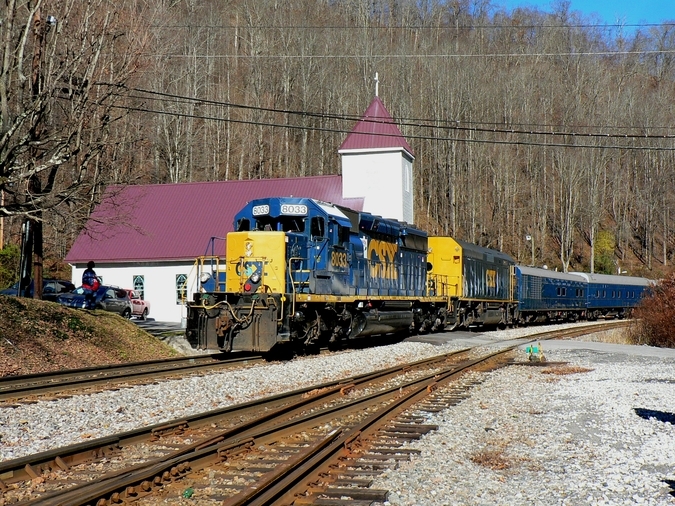 Four views of the motive power at arguably the most recognizable location on the Clinchfield. The long standing Dante Union Baptist Church has for eons indeed baptized the scene with the essence of pure Appalachia. 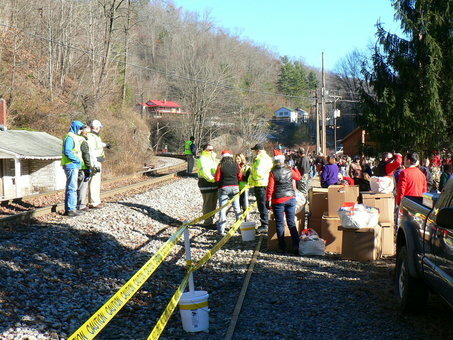 The train was stopped in these scenes while Santa conducted business at the rear. During this pause, the crew steps out for a stretch while other folks admire and take photographs. All images Dan Robie 2015. Below are rights of way scenes taken at Dante prior to the Santa Train arrival. I decided upon grayscale conversions for these to project mood and a nostalgic feel. The Clinchfield signals are the principals here in conjunction with the yard tracks and the trackside homes are representative of scenes across Appalachia. If the reader would be interested in the colorized versions of the images, contact me via the Visitor Feedback page. 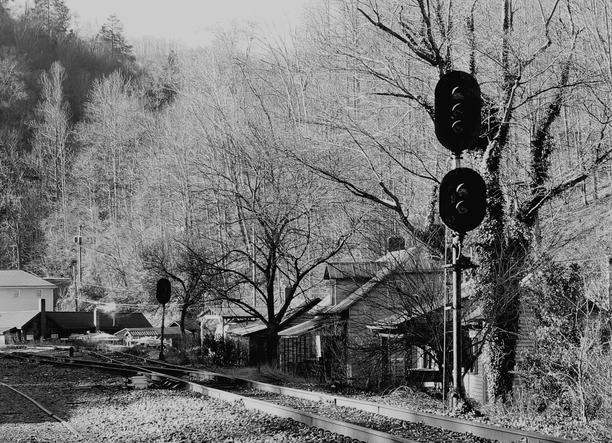 The echo of a train horn or whistle is a haunting sound in the valleys of Appalachia. No different at Dante. The Santa Train was heard before it rounded the bend along Lick Creek on its approach to stop in town. People flocked trackside to the rear of the train---most were local but a good percentage was visitors to witness and document this event. Although the faces, attire, and photographic gear changes with the decades, the anticipation of the train was identical to the seventy-two previous years. The young remain forever young in a timeless zeal that transcends individual mortality. In a contemporary world wherein youth are showered with the latest in technology---smart phones, X-Boxes, internet streaming, and so on---there remains an excitement with the simple. To see the reactions of the children looking at Santa on the rear platform with both he and the volunteers dispensing gifts was priceless. But the greatest gift is that it will be everlasting. They will someday share this experience with their children and grandchildren just as previous generations have done. Hopefully, there will still be a Santa Train for them to share it firsthand. South of Dante, we stopped to look and take photographs. Dante Yard extends south of town and the vestiges remain of the stature this facility once held for operations. In addition to the yard tracks, the turntable and locomotive service rack was still intact reminding one that this was a prominent location during the Clinchfield era. 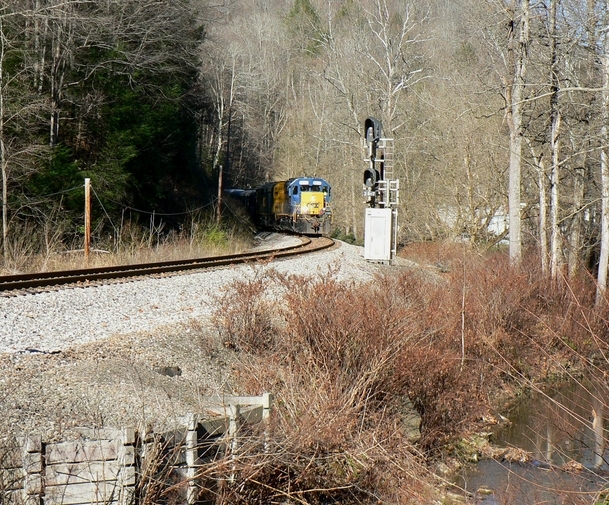 There were two tracks of empty CSX hoppers repositioned here for storage. Judging by the rust on the trucks and wheels, these cars have been here for a long period of time. 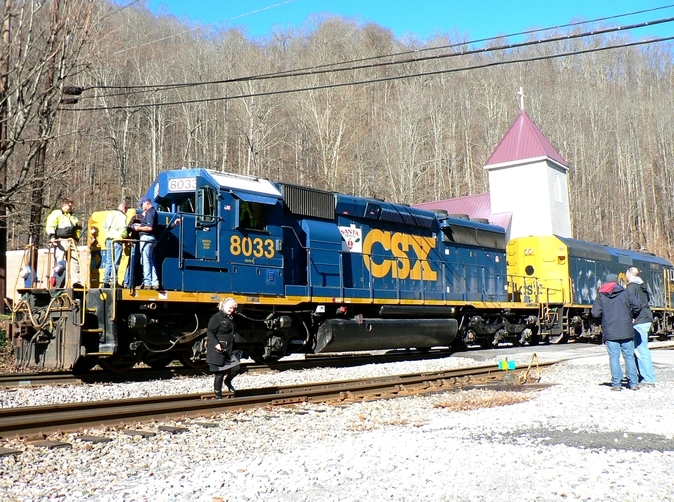 CSX employees were at various points in the yard---some on the job associated with the Santa Train and others to watch it pass from that vantage point. High above on the highway, trees restricted the view preventing "clean" photos of the area. Because these images are obstructed, they are of little use to share here. Past the south lead of Dante Yard is the tiny hamlet of Sun. We pulled off the road here to await the departure of the Santa Train from Dante having found an "S" curve and a signal adjacent to Lick Creek. Other photographers lined neighboring locations along the highway and how we secured this spot was surprising. Once the train passed, our objective was to reach Dungannon before it did. As we drove paralleling the railroad, how striking it was the number of photogenic locations to photograph trains on this most scenic railroad. At Dungannon, a large crowd was already gathered trackside and it appeared most prime locations for photographs were already claimed. Jogging my memory, I looked for the vision of the sweeping curve here seen in images from years gone by. Either I missed the vantage point or growth during the intervening years had obscured that panorama. The train had not yet arrived at Dungannon but we decided to move on to Fort Blackmore with extra time to stake out a location. At Fort Blackmore, we crossed the Clinch River bridge with a first thought of taking photographs from atop it. 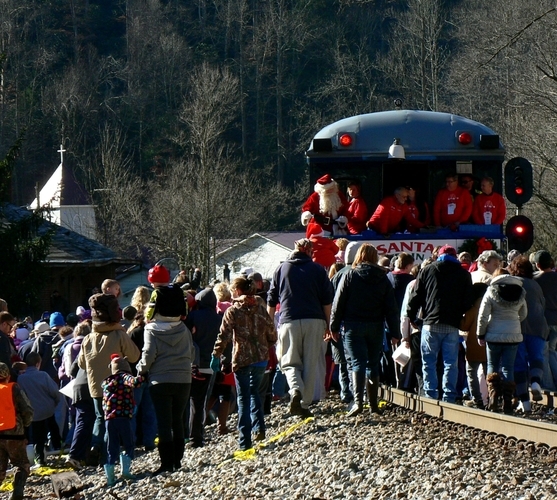 A popular vantage point, it offers a view of the train and the people congregated at the Santa stop. Instead, we opted for the downriver side and a farm located below. An access road ran directly to the property. Once we drove to ground level at trackside, we followed the road to its end at a farm house and private property. Not wanting to trespass, I walked to the house to ask for permission to park and shoot photos at the farm. A most polite lady came to the door and she gave us the OK to do so. If I knew her name, I would acknowledge her here---but then again, she might just prefer the anonymity instead. Dear Madam, if ever you see this page, you will know of whom I speak---we thank you again. From the inner self, I would have been happy to visit this farm without the anticipation of the train. It was a literal paradise that beckoned to the soul of this Mountaineer and encompasses the simplicity of life sought as I plunge deeper into middle age. A farm house on a knoll overlooking beautiful bottom land on which this small scale farmer would grow a variety of crops, the Clinch River with fish therein, and, of course, a railroad running through it all. Sadly, no more trains as it is now but there is always the hope. But there was at least one more train to see and we were there at the right time, the right place, and for the right train. The photos above---and more not on the page---were satisfying for both Matt and I were quite pleased at our respective efforts. We had thoughts of stopping at the legendary Copper Creek viaduct to catch the train passing high above the gorge it spans. Upon leaving Fort Blackmore, heavy slow moving traffic thwarted any realistic attempt at accomplishing this. Besides, we knew many others were thinking identical thoughts and finding a place to park there let alone seeking a good spot to shoot photos was slim. This will be a must stop in the future if there is again an opportunity. With this stop now by the wayside, we directed our efforts to locating another spot or two before returning to Kingsport. Near Frisco, we came to a bridge that spanned the railroad and on one side, a tunnel portal. Unfortunately, the low November sun did not illuminate this scene during what was now early afternoon. David suggested we go to the Holston River bridge on the outskirts of Kingsport. We followed the river road for a few miles and suddenly came upon a mass of cars parked beside the road hoping to arrive before the train. People were already on site so we knew it had not yet passed. Fortunately, a vantage point was still available for us to squeeze in for a shot. The Santa Train crossing the river in the image above was the result. Back in Kingsport, we had hoped to see the train at its terminating stop. We quickly found out this was easier said than done for when we attempted to reach the station area, the streets were blocked off for the city Christmas parade which was coordinated with the Santa Train arrival. With the remaining daylight, we turned the attention to roaming around Kingsport and perhaps a few twilight and night shots. 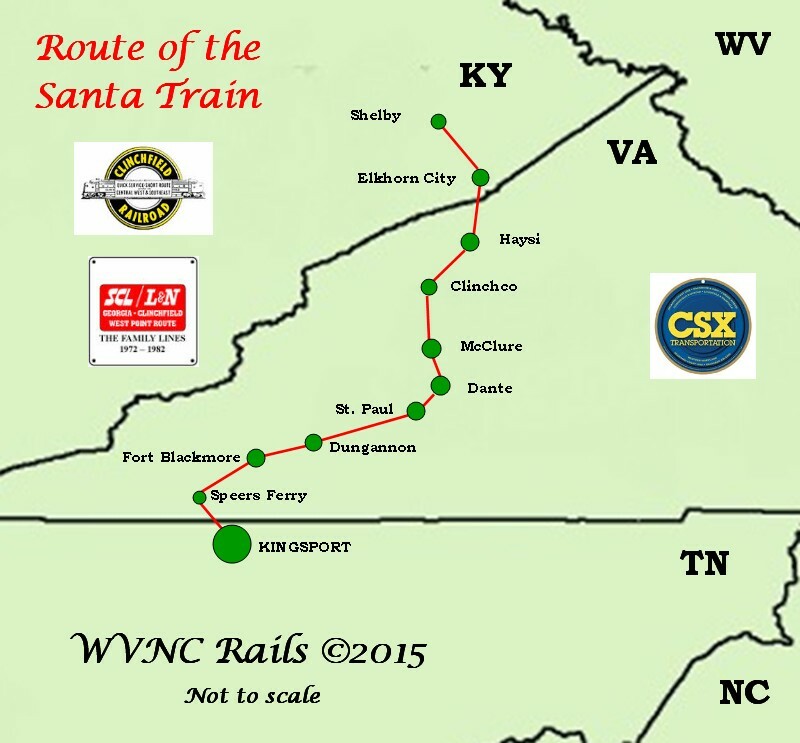 We had hoped for the possibility of seeing the Santa Train the next morning but that possibility was quickly nixed when we heard the train on the scanner departing Kingsport. It deadheaded south on the Clinchfield through Erwin-Bostic-Spartanburg for the return to Jacksonville. Thoughts prevail about this trip and what future may lay ahead. In a sense, bittersweet, for the impression from the heart of the Clinchfield is also concurrent with the current state of affairs. 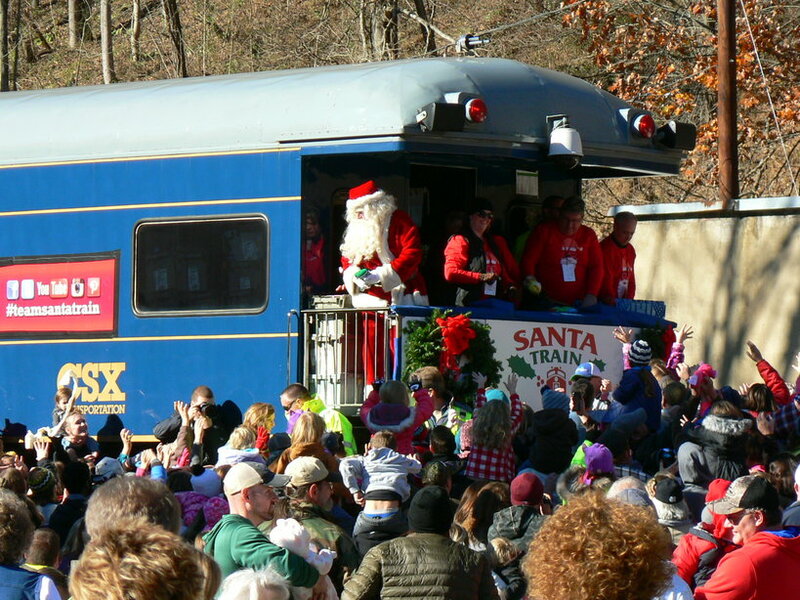 I was grateful to be afforded the opportunity to see the Santa Train as it traversed the mountains and valleys of Virginia and Tennessee. All that I had heard from others was true and then some. The Clinchfield territory is impressive, if not magnificent, and the railroad through this rugged terrain worthy of its fabled existence. I hope that it is not my first and only venture to its domain. If indeed there is another run in 2016 and beyond, the objective will be to see the train at different locations. There are unquestionably others that will echo this sentiment. Ultimately, what is in the long term future of the former Clinchfield and the Santa Train itself? 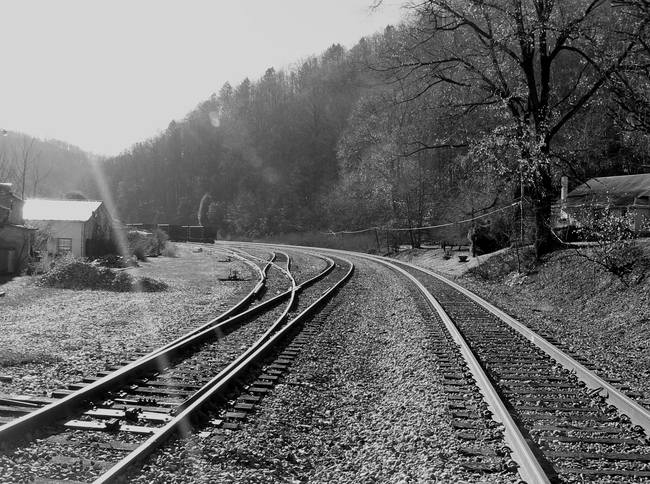 All but for roughly a 20 mile section between McClure and St. Paul, VA, the railroad will remain in use. Norfolk Southern utilizes trackage rights in the St. Paul region although CSX now does not operate north of Kingsport, TN to McClure. 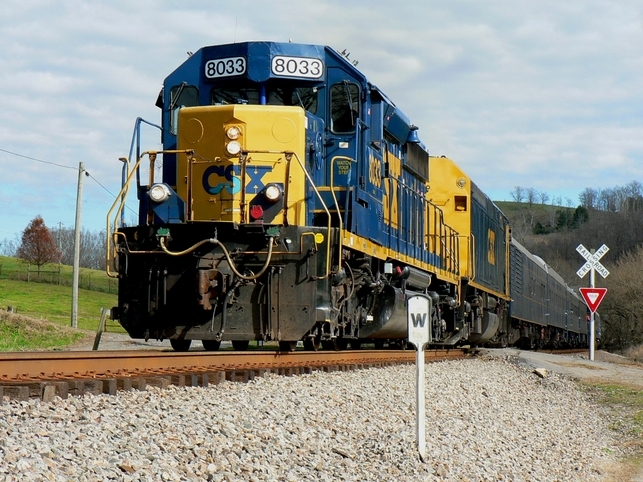 The prospect of a resurgence in coal is dim but a potential for the Clinchfield to reopen as a mainline corridor exists merely due to its route. Since the closure in October 2015, freight, both manifest and bulk, in many instances is now running hundreds of miles on roundabout reroutes increasing transit times. If shippers become dissatisfied over the course of time---or with the development of presently unforeseen events--- this could prompt a reactivation of the Clinchfield as a through route. Time and circumstances will tell. CSX has stated that it has no intent to cancel the Santa Train. The assumption is that it will continue on the Clinchfield as no alternatives have been mentioned as of this writing. Predicting actions in the world of business is akin to a weather forecast, however---the climate can change quickly and without notice. 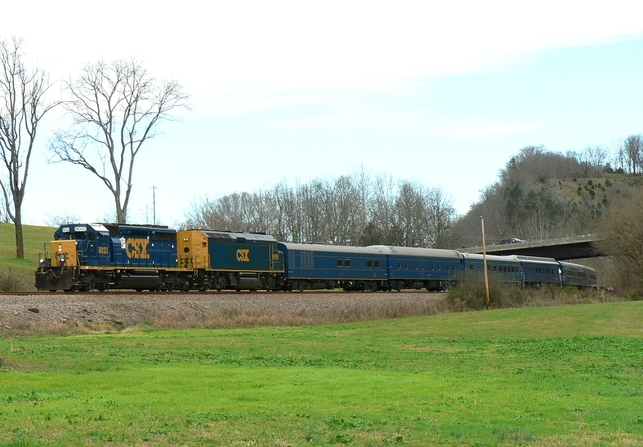 Finally, I am grateful for those who have documented the Clinchfield history from its beginning through the CSX era. There are volumes dedicated to the subject that are thorough and photographers---a gentleman named Ron Flanary who immediately comes to mind---that have recorded trains through the lens for years on this railroad. These aces--to use a baseball analogy---have pitched a complete game on the topic. This humble effort on my part is merely a pinch hit in the bottom of the ninth with two outs and the bases empty comparatively speaking. Hopefully, I have satisfied the reader with at least a single.